This image surfaced on the website of the TENAA, China's regulatory agency that is roughly equivalent to the FCC, along with a bare minimum specifications that indicate the phone will have a 5.5 inch screen, a 2800 mAh battery, and will be 7.54mm thick (or should I say thin?). The Chinese iteration of upleaks had previously posted about the E9, with claims that line up perfectly with the regulatory filing. Additionally, upleaks claims the E9 will have a MediaTek 64-bit 8-core processor, a departure from the Qualcomm 810 on the just-announced M9. 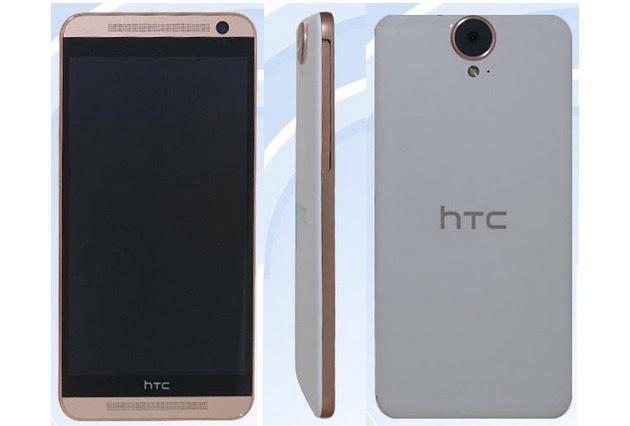 They also claim that 5.5" screen will be Quad HD, the first of its kind for HTC. Other supposed details include 3GB RAM, 20MP back shooter (a la M9), and a selfie camera that is 13MP in "standard" models and is the 4MP UltraPixel sensor from the M8 in a more premium version of the E9. Their info could be bunk, but it helps to know they matched up with the TENAA posting. There is obviously a lot left to be worked out. First of all, will this device even be released outside of China? The filing is for a dual-SIM device. The E8 only made it to Sprint in the USA, after all. Also, what is HTC shooting for with this phone? The E8 was basically a plastic M8 with a few other minor differences meant to be a cheaper alternative to the flagship. The E9 is something else entirely. Still, it appears from the picture that this is a plastic design, though the outer band looks to be made of metal. As interesting as this new information is, it has raised nearly as many questions as it answered. We will certainly be hearing more from HTC soon, who is in desperate need of the sort of positive press they received back when they rolled out the M7.